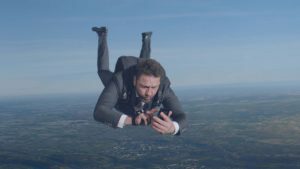 Enterprise Rent-A-Car launched its latest advertising campaign by creative agency The Corner. The TV ads prove – beyond doubt – that Enterprise can handle the most demanding car rentals imaginable. 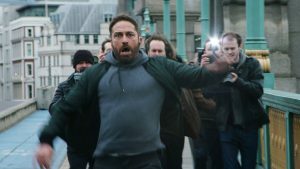 The centre of the campaign is two 30-second TV adverts – Skydive and Paparazzi – which follow Gerard Butler in a series of high-intensity action sequences, including free-falling from 20 thousand feet and escaping a desperate paparazzi ambush. 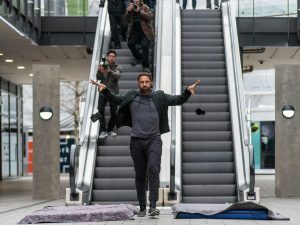 Skydive will be seen on UK television and will run for two weeks. Paparazzi will then air from 22nd April 2019, with an extended version showing during screenings in UK cinemas nationwide. The mantra of ‘whatever the mission’ will be used across digital, out of home and Enterprise’s 470+ branches across the UK. Skydive shows Butler leaping out of a plane and calling Enterprise to organise a convertible with the roof down for him to land in.